Connemara is a well known district but one which causes a certain amount of confusion as to its geographical application. Once an ancient kingdom known as a tuath, its boundaries are no longer well-defined and the term is now frequently used to describe all of County Galway west of Lough Corrib. However, although Oughterard and its surrounding area lies well inside Iar Chonnacht (County Galway west of Lough Corrib) they have never been included under the term ‘Connemara’ but instead has held, for many centuries, the title of “The Gateway to Connemara”. This begs the questions: how was Iar Chonnacht diveded in medieval times and what tuath was the Oughterard area part of? 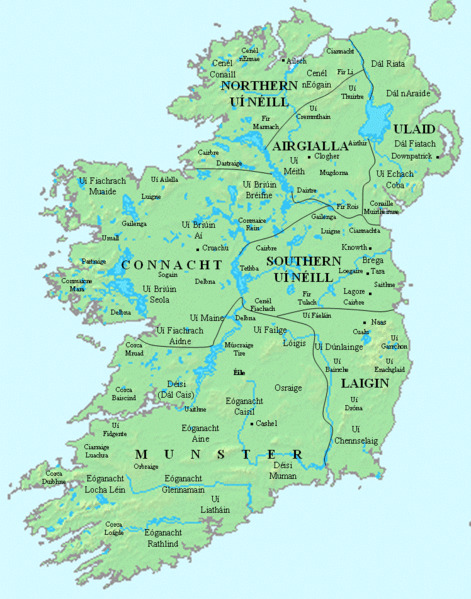 The Conmhaícne (descendants of Con Mhac) were an ancient tribal grouping that were divided into a number of distinct branches that were found scattered around Ireland in the early medieval period. They take their name from a mythical ancestor known as Con Mhac (son of the hound). The Conmhaícne Mara (the Conmhaícne of the sea) were located in what is now the extreme west of County Galway and gave their name to the territory they occupied i.e. Connemara. The territory of Connemara covers all of the barony of Ballynahinch containing the five civil parishes of Ballynakill, Ballindoon, Moyrus, Omey and Inishbofin (which is in the barony of Murrisk). The area to the east of what is now Connemara was called Delbhna Tír Dhá Locha. Delbhna Tír Dhá Locha ( The Delbhna of the Two Lakes ) was a tuath located in west Co. Galway held by a branch of an ethnic group called the Delbhna. Originally one large population, the Delbhna broke into a number of branches in Connacht, Meath, and Munster following internal warfare and the influx of other groups. The two lochs to which the name of the territory refers are Loch nOirbsean (Lough Corrib) and Loch Lurgain (Galway Bay). The territory occupied nearly all the land between the two lakes and the River Corrib and was roughly contiguous with the later barony of Moycullen, which took in the civil parishes of Moycullen, Kilcummin, Killanin, and Rahoon. The chiefs of the Delbhna Tír Dhá Locha eventually took the surname MacConraoi, or Conroy. Their title as chief of their name was Mac Mheic Con Raoi (grandson of the hound of the battlefield) while their title as rulers was Rí (King of) or Tighearna (Lord of) Thira Da Locha. In time, almost all members of the family anglicized their name to King. Mac Conraoi was chief of Delbhna Tír Dhá Locha, directly ruling Gnó Mhór, a region containing the civil parishes of Kilcummin and Killannin. Mac Conraoi’s eldest cadet Ó hÉanaí, or Heeney, ruled Gnó Beag, made up of the civil parishes of Rahoon and Moycullen. Loch Lonáin (Ross Lake) north of the village of Moycullen and the Aille River between the villages of Spiddal and Inverin are the principal features which mark the divide between Gnó Mór and Gnó Beag. All four parishes were combined into the barony of Moycullen soon after the Cambro-Norman invasion. This page was added on 05/05/2013.